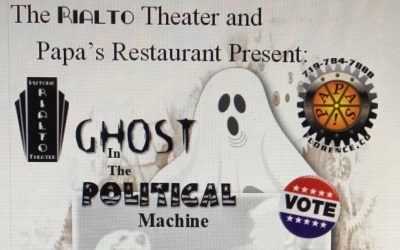 Dinner Theater performances at the Rialto Theater, Florence, Aug 24 – 26 and Sep 1 – 3, 2017. Tickets were $22 per person and show-only tickets $10. 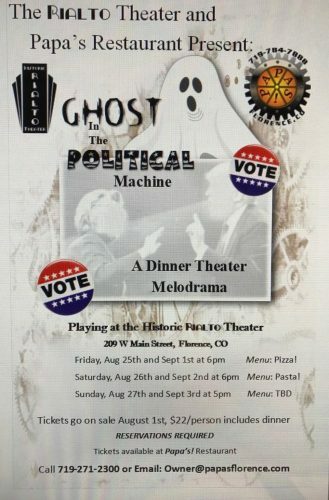 Play written by Tom Bruno, owner of Papa’s! Restaurant. Opening Night Smashing Success!!! The theater doors opened at 5:30 pm (Friday and Saturday) and 4:30 pm (Sunday) and auditorium curtains opened 10 minutes before dinner. The melodrama lasted about an hour and refreshments (beer, wine, soda and concessions) were available until curtain.